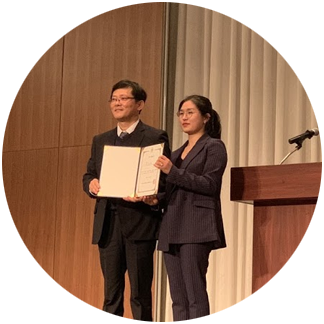 Jinyoung and Taesu received an best paper award in the Annual Conference of the Ergonomics Society of Korea held in Gyeongju, Korea. Jinyoung is an undergraduate intern of Color Lab and presented about her undergraduate research program(URP) entitled, “Passengers’ Activity Patterns and the Sitting Postures in Express Bus [고속 버스 탑승객의 행동 유형과 착석 자세 간 관계]”. In the presentation, she proposed categories of activities in public transport based on posture changes of user’s back and leg angle. Congratulations!